The world’s most recognised beer brand, Heineken is a truly international pilsner-style pale lager beer and in order to satisfy demand it is brewed at over 20 different breweries around the world. However, all the Heineken sold in the UK is brewed at Heineken’s vast Zoeterwoude Brewery, some 40 minutes outside Amsterdam. The flagship Heineken brewery, Zoeterwoude, is where the all-important Heineken A-yeast is cultivated for use in Heineken’s other breweries. It is also home to Heineken’s central laboratories which receive samples from the other breweries to ensure quality is maintained and Heineken’s flavour remains constant wherever it is enjoyed in the world. The other Heineken breweries have to replicate the beer brewed at Zoeterwoude by tweaking the recipe and the mineral content of local water. Zoeterwoude is also where Amstel, the other great lager of Amsterdam, is brewed and 10 million hectolitres of the two brands are shipped from the brewery each year. Gerard Adriaan Heineken was a very technical brewer who understood that great beer was not made by chance but by understanding the science behind each stage of the brewing process and using the best ingredients. He was also one of a new breed of brewers making clean crisp lightly coloured lager beer rather than heavier, fruity, dark ales. Lager-style beers were first brewed in Bavarian breweries in the late 15th/early 16th century. Although man has brewed ale for millennia he/she could only brew ales. Lagers were not brewed before the end of the 15th century because the all-important special hybrid strain of yeast necessary to make lager was yet to come into being. Lager yeast comprises two sets of chromosomes from ale (baker’s) yeast (Saccharomyces cerevisiae) and two which have been traced to a wild Patagonian yeast (S. eubayanus). In the way a new flu epidemic travels the world by being carried by plane travellers, so the Patagonian yeast travelled to Europe with the then newly available goods shipped from the New World. The globetrotting Patagonian yeast (S. eubayanus) fused with ale yeast (S. cerevisiae) and evolved to form a hybrid strain which ended up in a Bavarian brewery. The new lager brewing strain of yeast (S. pastorianus) was introduced to other breweries across Europe. Then in the 1820s brewers in the town of Plzeň discovered that this yeast strain allowed beer to be brewed at lower temperatures, producing a clear beer with a different taste we now know as Pilsner lager. However, yeast science was still in its infancy and this precise yeast strain was yet to be identified. Remember, it was only as recently as 1836 that Cagniard de Latour proved yeasts were living organisms and not chemical substances, as had previously been believed. When our hero, Gerard Adriaan Heineken, first brewed his beer in 1874 it was a Pilsner style lager beer (as it is today) brewed using Bohemian yeast. However, he and other brewers suffered with batches often inexplicably turning sour during production or when distributed. In 1876, Louis Pasteur published his “Etudes Sur La Bière”, a publication in which he wrote about beer fermentation and his belief that some beers turned sour due to the effects of other micro-organisms contaminating the beer. He hypothesized that if uncontaminated yeast was used with purified air, one could prevent beer decaying. In common with Heineken, Henry Younger, owner of the Abbey of Holyroodhouse Brewery in Edinburgh, Scotland, was also experiencing sudden, unexplained souring of batches of ale. Younger was inspired by Louis Pasteur’s publication to hire a chemist who in 1877 was sent to Europe to study the latest developments in yeast. 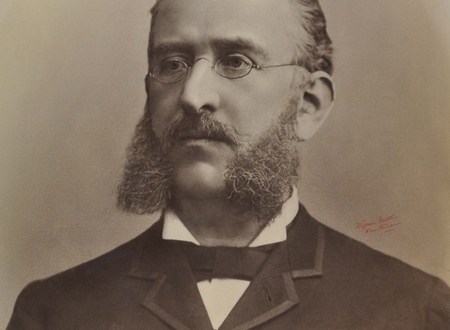 Jacob Jacobsen, the owner of the Carlsberg brewery in Denmark also decided to invest in micro-biological research and in 1879 hired a Danish mycologist, Dr Emil Christian Hansen who isolated and described (S. pastorianus) lager yeast. He then developed a technique to separate different types of yeast and form colonies of pure yeast through single cell cloning and in 1883 he designed a machine to propagate the pure yeast on a semi-continuous basis. Meanwhile Heineken’s brew master Feltmann was discussing the problem with batches souring with his colleague Hatt in his Alsatian brewery. Jacobsen, Carlsberg’s owner, proposed that European brewers should all work together in the hope of finding a common solution. So in 1885, Feltman travelled to the research institute of beer in Munchen where various European brewers met to discuss the issue. Feltman was the only Dutch brewer to attend. Feltmann returned to the Netherlands and convinced Heineken’s executive board to build a research laboratory at their brewery in Rotterdam. This was inaugurated in 1886 with Dr Hartog Elion, an apprentice of Louis Pasteur, appointed head of Heineken’s laboratory. In his first year, Elion constructed an improved version of Hansen’s pure culture machine and used it to cultivate multiple yeast strains, among others the well-known Heineken-A yeast. Heineken still use the A-yeast developed by H. Elion to brew their beer and it is this yeast that Heineken say most defines the flavour of their beer. The now instantly recognisable oval green Heineken label, with its five point star and black horizontal bar with curled up edges, originates from at least 1883. Over the years, medals won by Heineken were added to the label: Medaille d'Or (Gold Medal) in Paris in 1875, Diplome d'Honneurs (Honorary Diploma) at the International Colonial Exposition in Amsterdam in 1883, Grand Prix (Grand Prize) at the Exposition Universelle in Paris in 1889 and the Hors Concours Membre du Jury in Paris in 1900. In the 1930s the Heineken red star first appeared when a different rectangular label was launched in the Dutch market. The red star was also added to the export label which remained oval and green with the black bar. In 1951, after the Second World War, the red star was changed from red to white with only a small red border due to the red star’s perceived association with communism. Over the years the star’s red border was gradually made more prominent, until 1991, when the star turned completely red again. Heineken decided their label should be uniform in all markets so in 1954 launched the previously export only green oval label in the Dutch market. This is also when Alfred Heineken decided to have only his name on the black bar instead of the style of beer as had previously been the case (e.g. Munchener, Dortmunder or Bavarian beer). He also wanted the label to have a friendly presentation so the capital letters were replaced with rounded lower case letters and the ‘E’s became smiling ‘e’s by giving them a small backward slant. 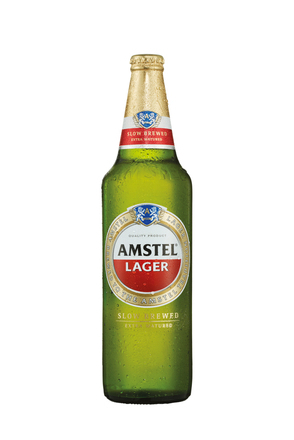 Amstel is a pilsner style lager named after the Amstel River, the water of which was used for cooling production at the first Amstel Brewery founded 11 June 1870 in Amsterdam. Heineken Dark Lager is a European-style dark lager brewed in Holland.